What Wedding Flowers Are Trending In 2015? The new year has arrived, and that means bridal consultants, wedding planners, and industry experts have projected new, fresh trends for the coming months. Wedding day wisdom, when viewed as a whole, can get overwhelming, so it is best to break it down, piece by piece. So what’s the latest on flower arrangement ideas? What flowers are you most likely to see at weddings this year? For a long time, many brides viewed roses as too common, or overdone. Thankfully, that point of view is fading into the background. Part of the shift is greater awareness; today, more Americans realize that roses can be incredibly versatile, with over “120 varieties to choose from,” according to The Knot. 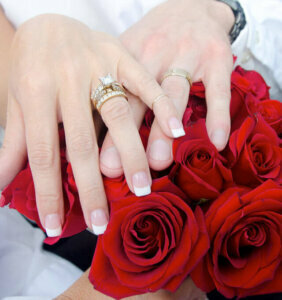 Wedding florists add that roses can be dyed just about any color, making them the perfect choice. “Inspired by A-list celebrity weddings such as Kim and Kanye, next year’s brides are choosing full-on luxury for their wedding flowers,” Wedding Ideas Magazine writes. The publication recommends avoiding fillers like baby’s breath, and focusing on opulence with orchids, hyacinths, and other high-class flowers (sans leaves and foliage, of course). A few words of caution: If you plan to go this route, carefully pay attention to wedding flowers prices. On the opposite side of the spectrum, some couples want a relatively modest ceremony and reception (at least cost-wise). For these brides and grooms-to-be, it is important to have beautiful wedding flowers, but also inexpensive wedding flowers. It is possible! Couples can purchase locally, and choose seasonal blooms to keep costs low. If you have your heart set on a particular flower, consider getting married when it is in season. Every year, florists earn $7 billion — and a large portion of it comes from wedding flowers. Choose the best (and, if applicable, most economical) bouquets and decorations; for wedding flower arrangement ideas, consider all of the different roses, local and seasonal blooms, and, if you’re willing to spend a bit more, luxury blossoms.